Chickpea sprouts, also known as garbanzo bean sprouts, are a protein-rich, high-carbohydrate food made from chickpeas. The sprouting process is simple -- you merely soak the chickpeas in water overnight, then rinse and drain the chickpeas several times daily until visible sprouts, which look like white tails, emerge from the chickpeas. These chickpea sprouts are relatively low in calories, so you can consume them even when dieting. Chickpea sprouts are relatively low in calories, as a 100-gram serving of the sprouts contains only 165 calories. That amount comprises about 8 percent of the daily suggested intake of 2,000 calories, but it is higher than the amount in some other types of beans. For example, a 100-gram serving of black beans would contain just 130 calories. Chickpea sprouts are low in fat, as each 100-gram serving contains 4 grams of fat. Of this fat, only 1 gram comes from saturated fat, a type of fat that may increase your risk of heart disease when you eat too much of it. The American Heart Association suggests a daily limit of less than 16 grams of saturated fat to reduce cardiovascular disease risk. Chickpea sprouts are a rich source of protein. Each 100-gram serving contains 10 grams of protein, which is 2 grams more than a cup of milk provides. Every cell in your body contains protein, and protein is continually broken down. Therefore, according to the Centers for Disease Control and Prevention, daily intake of protein is vital for your overall health. The Institute of Medicine suggests that you eat 0.8 grams of protein daily for each kilogram of body weight. Chickpea sprouts are also a rich source of carbohydrates. A 100-gram serving of the sprouts provides 24 grams of carbohydrates. Carbohydrates are your body's primary source of energy, so carbohydrate-rich foods such as chickpea sprouts can be good choices for pre-exercise meals. Unless you have been put on a low-carb regimen by your doctor, the recommended intake of carbohydrates is 130 per day for both men and women. 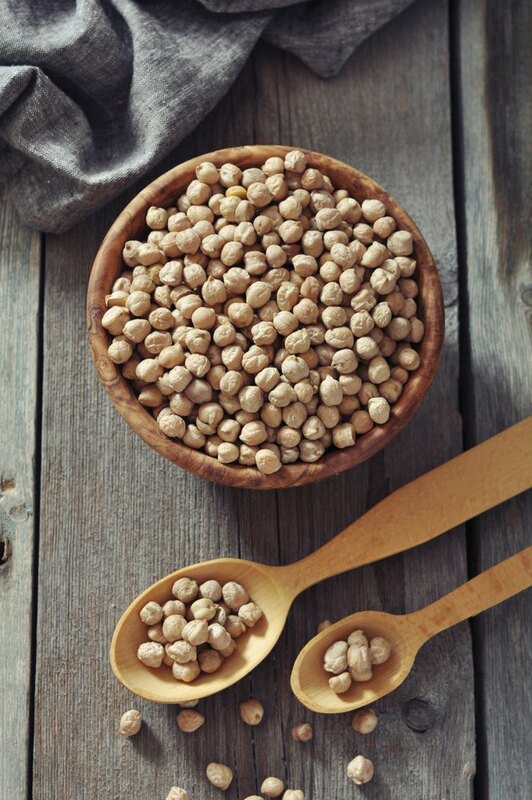 One type of carbohydrate chickpea sprouts provide is dietary fiber; each 100-gram serving contains 3 grams. Dietary fiber is important because it promotes feelings of fullness, helps stabilize blood sugar levels and may help reduce your cholesterol levels and risk of heart disease, according to Harvard School of Public Health. The recommended intake for fiber is 25 grams for women and 38 grams for men. Chickpea sprouts are high in vitamin C, with 45 percent of the daily suggested intake in each 100-gram serving. Chickpea sprouts also contain 16 percent of the daily suggested iron intake in an 100-gram serving. Adequate vitamin C intake may help prevent cancer, heart disease and the common cold, according to the National Institutes of Health Office of Dietary Supplements. Recommended vitamin C intake is 65 milligrams per day for women and 75 milligrams per day for men.